Our custom dock designs are choosing both practical and unique, designed to accommodate our client’s specific needs. One of the more important aspects of marine dock construction is the proper installation of the pilings. This is what sets Ashcraft Marine apart from other marine construction companies. Prior to the dock construction, a site visit is necessary to assess all relevant factors that affect piling installation. Ashcraft Marine uses the proper equipment to set your pilings correctly with an air hammer driving technique to ensure proper embedment. Our dock gallery showcases a comprehensive spectrum of the dock styles and configurations that we have designed and constructed for our clients. Bulkheads (Seawalls) should not only protect your property but also be pleasing to the eye. Whether you need new construction, bulkhead repair, reinforcement or replacement; we offer vinyl & steel sheet pile, concrete, wood, or rip-rap bulkheads. You can view many different examples of the kinds of bulkheads that can be constructed in the Gallery section on this site. From jet-ski lifts to yacht lifts, Ashcraft Marine will install the proper lift for your vessel. Based on your specific boat we can determine the correct lift to install and tailor the lift to accommodate your boat with ease. We also offer service on boat lifts. This is very important to keep your boat lift in good working condition. Our boatlift service includes replacing worn-out cables, greasing the system, checking the motors, tightening bolts, checking for wear on lift components and the operation of the lift. Visual inspection of the cables should be performed by you each time you operate your lift. Boat lift maintenance is recommended on a yearly basis. The photo to the right shows a boat dock that has been battered by the sun and elements for 15 years. Your boat dock is a valuable investment and should not be neglected. 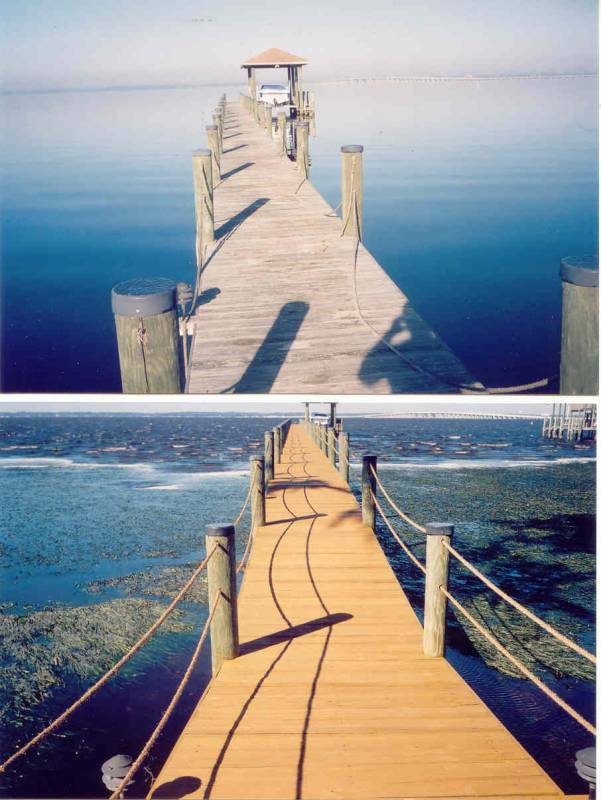 The bottom photo shows the transformation of this dock after pressure washing and the application of two coats of stain. This type of maintenance will give your dock a well deserved face lift and extend decking life. We recommend one application per year.